Yesterday was July 27 and yesterday I was surprised to see it's already time to hear the "back-to-school" message. Bed Bath and Beyond mailed us a colorful mini catalog, which was devoted to the back to school savings message, and yesterday I noticed our Super Target was already decked out with its school supplies aisles. It's still July, which was supposed to be the one month left on the calendar that had nothing to do with school. I really do feel sorry for kids these days, because it seems like the summers are just 8 short weeks. 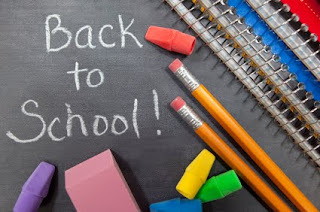 When I was in elementary school I can remember thinking summers were epic, and when I returned to school in the fall I can also remember looking feeling like everyone had changed over the summer.